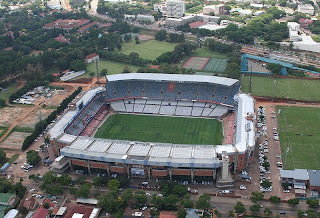 Loftus Versfeld Stadium is a sports stadium situated in Pretoria, South Africa. The stadium has a capacity of 51,762 and is an all seater venue. Minimal upgrading was undertaken in order for Loftus Versfeld Stadium to qualify as a venue for first and second round matches for the FIFA World Cup 2010 South Africa. The floodlights, sound system, scoreboards and stadium roof were improved and, while expected to be finished in August 2008, renovation was completed in January 2009.